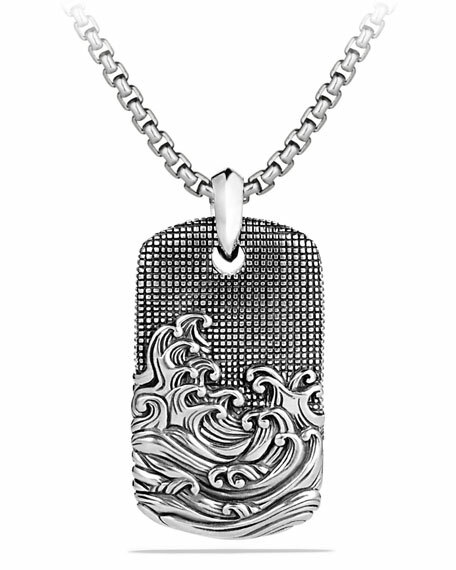 David Yurman men's tag from the Waves Collection. Signature sterling silver with waves motif. Please Note: Tag only; chain sold separately. David Yurman men's knife-edge cross pendant/enhancer from the Amulets collection. Pav?? black diamonds, 0.45 total carat weight. Approx. 1.1"L (27mm). David Yurman men's knife-edge cross pendant/enhancer from the Amulets collection. Pav?? black diamonds, 0.45 total carat weight. Approx. 1.1"L (27mm). Sterling silver. Imported. Please note: Amulet only; chain sold separately. David Yurman men's six-sided pendant enhancer from the Hex Collection. Textured sterling silver and engineered rubber hardware. Approx. 1.2"L (29.5mm). David Yurman men's six-sided pendant enhancer from the Hex Collection. Textured sterling silver and engineered rubber hardware. Approx. 1.2"L (29.5mm). Made in Italy. David Yurman men's kick cuff bracelet from the Hex Collection. Rubber band with logo on inner side. Hexagonal sterling silver end caps. 8mm width. Made in Italy.